Segmentation can be defined as the identification of "meaningful" image components. It is a fundamental task in image processing providing the basis for any kind of further highlevel image analysis. In medical image processing, a wide range of applications is based on segmentation: One may think of the volumetric analysis with respect to normal or pathological organ development, temporal monitoring of size and growth in pathological processes, or as a basis for the applicability of automatic image fusion algorithms when combining the complementary information obtained by different image acquisition modalities. Still, the simplest way to obtain good segmentation results is segmentation by man. This yields excellent results, which is due to the fact that human operators do not only apply the presented image data information, but also make use of additional model-based knowledge such as anatomical skills as well as complex psychological cognitive abilites, e.g., with respect to orientation in space. 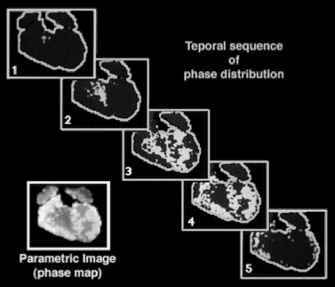 However, the segmentation of hundreds of MRI or CT slices by manual contour tracing is a very time-consuming task that requires a considerable amount of human intervention. Therefore, it is desirable to perform segmentation by machines. However, this is difficult to achieve, as the complex cognitive abilities just mentioned can hardly be transferred to computer programs. An efficient strategy to cope with this problem is to present additional image data information as an input to automatic image segmentation systems, thus compensating for the lack of high-level image analysis capabilities in machines. A possible realization of this principle is the acquisition and processing of "multispectral" image data sets, which forms the basis of the segmentation approach presented in this chapter. A huge variety of automatic medical image segmentation procedures has been described in the literature. A good survey is provided by the list of citations published in  that may serve as a good starting point for further reference. Examples for different segmentation methods range from simple histogram-based thresholding or region growing algorithms, to more sophisticated techniques such as active contours or watershed transformation. steps comprise the anatomically correct registration of the data sets and masking a region of interest in which the segmentation should be performed. Finally, each voxel can be characterized as a vector in a «-dimensional feature space composed of the gray levels obtained for the different image acquisition techniques. Segmentation then becomes the problem of classifying these multidimensional feature vectors as belonging to a specific element among a given set of alternative "meaningful" image components. The segmentation algorithms described in this chapter are not based on presumptive heuristic rules derived from anatomical meta-knowledge of how such a classification decision should be made. In contrast, purely data-driven self-organization of the classifier is employed according to the principle of "learning by example" rather than analyzing the data according to a fixed set of given rules. In this context, data analysis may be performed by two different strategies. The first one tries to identify characteristic properties of the multidimensional data distribution of unlabeled feature vectors, i.e., without a given interpretation of the data with respect to the segmentation classes. We refer to this approach as unsupervised clustering (UC). The second strategy involves labeled data, i.e., the learning algorithm requires both the feature vector itself and a target function defining its interpretation with regard to segmentation class membership. This approach resembles learning with a teacher. We call it supervised classification (SC). 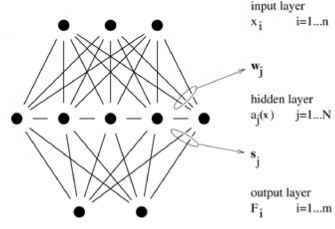 Neural network computation offers a wide range of different algorithms for both UC and SC. Some of them have been used for multispectral image segmentation in the past. However, UC and SC are usually treated as completely different issues. In this chapter, we present an algorithmic approach that aims to combine UC and SC, where the information obtained during UC is not discarded, but is used as an initial step toward subsequent SC. Thus, the power of both image analysis strategies can be combined in an integrative computational procedure. This is achieved by applying so-called generalized radial basis functions (GRBF) neural networks. In the remainder of this article, we (i) explain the theory of GRBF networks in the context of UC and SC, (ii) discuss its application to medical image segmentation, and (iii) present our own segmentation results for multispectral 3D MRI data sets of the human brain with respect to the tissue classes "gray matter," "white matter," and "cerebrospinal fluid." FIGURE 1 Structure of the GRBF network. wA of the data vector x with respect to the virtual position Wj of the hidden layer neuron j. d hereby defines an arbitrary metric in the feature space, e.g., the Euclidean metric. The term "virtual position" is based on the idea that the activation aj of the hidden layer neuron should take its maximum value xmax A Wj, which can be looked at as a "specialization" of the neuron j with respect to the position max"